Raumfahrt+Astronomie-Blog von CENAP - Blog: Raumfahrt - Test Driving the New Astronaut Taxi In Washington, invited guests get a glimpse of a commercial spaceship. crashed the Boeing CST-100 Starliner into the side of the International Space Station. A “lateral misalignment” with the docking collar was the fatal error. A simulated Starliner, fortunately. And a simulated station. The actual $4.9 billion vehicle, which launches atop an Atlas V rocket and will have its first test flight (without a crew) in April, is a fully autonomous space taxi. But on later flights, its human passengers—who, unlike me, will have trained extensively on its flight controls, including the rocket-pulse steering controller that proved too responsive for my unpracticed left hand—can take command in the event of an emergency. 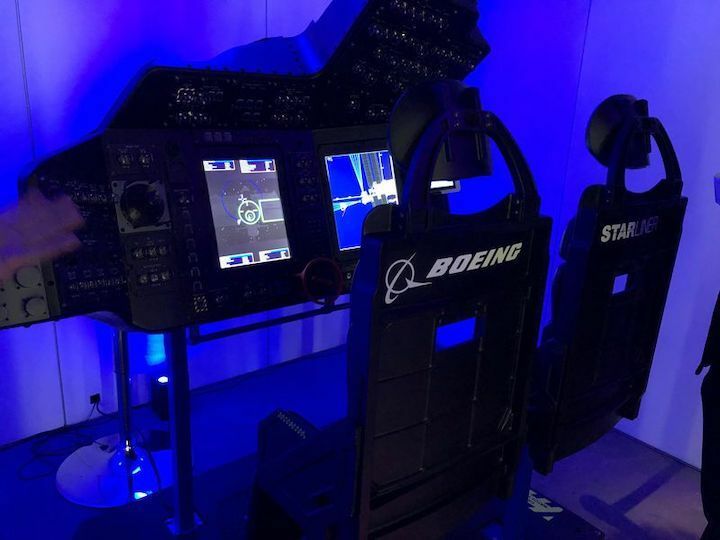 That simulator is the most impressive component of “To the Future,” an “immersive space travel” experience that Boeing has set up with the firm Axios in downtown, Washington, D.C. through Feb. 14. “It’s like Cape Canaveral, without the mosquitos,” says Gordon Johndroe, Boeing’s V.P. of Communications for Government Operations. An invitation-only audience of members of Congress, area school students, and other key stakeholders will have the opportunity to take a loosely simulated flight aboard the (partially) reusable space capsule. The circular flight-demo room, with its concave-shaped viewscreens on either side and its sofas that rumble to approximate the jostling of launch, is considerably roomier than the crew capsule, which is rated to carry seven passengers. During the “flight” to the International Space Station, a briefing video ticks off the features that distinguish the Starliner from its rival in NASA’s Commercial Crew program, SpaceX’s Crew Dragon. (Boeing and SpaceX are each building spacecraft to fly six crewed NASA missions to the ISS, though the companies will own and operate the ships themselves.) Only the Starliner can land on land. One of the slender blue spacesuits Starliner passengers will wear is on display as part of the exhibit. Josh Barrett, a communications specialist for the Starliner program, pointed out some of its unique features: Touchscreen-compatible gloves, boots based on Reebok athletic shoes, and a softshell hood that is lighter, less cumbersome, and easier to remove than traditional space helmets. Arriving at the International Space Station, attendees see another video simulation, this one of the surface of Mars—the big-swing destination that NASA and its industry partners hope will be the ultimate target for the space vehicles of the 2030s.